Microsoft Exchange is a client server collaborative application developed by Microsoft which is specifically designed to meet the requirements of small or large businesses. Today, every business is dependent on e-mail which makes important for Microsoft Exchange administrators to take regular backups of the Exchange Server so that data can be retrieved in case of data loss situations. Backup of Exchange server data can be easily created with the help of built-in NTBACKUP tool of Windows Operating System. The Exchange backup file is created as a .bkf file and it contains the .edb, .stm, and .log files of MS Exchange Server. At times, Exchange Server BKF file may also get corrupt due to any reason which makes it difficult to restore the data in data loss situations. Interrupted Backup: An interrupted backup process leads to corruption of BKF file. Malware Infection: A Malware can also infect your system and the BKF file to make it inaccessible. Missing or Corrupt Header: If Exchange BKF file header gets corrupt, then this can also cause corruption of Exchange BKF file. The above mentioned reasons are the most common ones that cause corruption of Exchange BKF file. In such situations, you can use Stellar Phoenix Exchange BKF Recovery software to repair the corrupt BKF file. 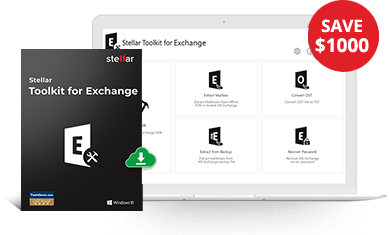 Stellar Phoenix Exchange BKF Recovery allows you to easily repair and recover Exchange backup data created from Exchange Server 2003 and Exchange Server 2007. With this software, you can also recover .edb, .stm, and .log files from the corrupt BKF file. Open the software, the main user interface gives two options to select a file: 'Select File' and 'Search File'. 1.1. If you know the location of the BKF file then click on 'Select File' option and then click 'Recover' to start the recovery process. 1.2. If you are not aware of the location of file then click 'Search File(s)' option, select the specified folder and then click 'Start Search'. 1.3. After the search is finished, a list of all the available BKF files are displayed, select the file and click 'Recover' button to start the recovery process. After the repair is complete, all the recoverable items of the BKF file are listed in a tree structure and a message appears showing 'Exchange BKF file repaired'. Click 'OK'. If you want to save all the repaired files, click 'Save All Files' to save all the files displayed in the right pane. If you wish to save only the selected files then select the files from the right pane that you want to recover then choose 'Save Selected Files' option. Here you also have the option to select the location where you want to save the recovered file. Choose 'Default Path' if you wish to save the file on the default location. However, if you want to save the file to a different location other than the default one, select 'User Defined Path', specify the desired location and then click 'OK'. After the saving process is complete, the software shows a message; "Saving process completed successfully".